Creating a compelling and engaging video experience has been an ongoing mission for content owners and distributors; Whether it was the introduction of CinemaScope in 1953 to stifle the onslaught of color TV, or the introduction of 3D films in the 50’s, the 80’s, and its subsequent re-introduction in 2009 with the launch of Avatar, to 4K Ultra high definition (UHD) TV, and retina quality video. In every way, gauging video quality has been a subjective exercise for consumers and experts alike. Beyond the signal to noise ratio (SNR) measurement used to compare different compression ratios or codecs, in many cases only a trained eye would notice errors such as compression artifacts, screen tearing, or telecine judder – unless they were persistent. A modest metric to assess a video file’s compression density is the Quality factor (Qf). In fact, the name is misleading since it is not actually a measure of quality, but an indication of video compression using three parameters: bitrate, the number of pixels in the frame, and the overall frame-rate of the video. Qf is essentially a measure of, “the amount of data allocated to each pixel in the video” . This metric doesn’t take into account the type of compression profile used, the number of passes originally utilized in the encoding process, or any tweaks implemented by the encoding engineer to optimize the video quality. So Qf, or compression density, is just a baseline guide for an administrator that is responsible for transcoding or managing large video libraries. 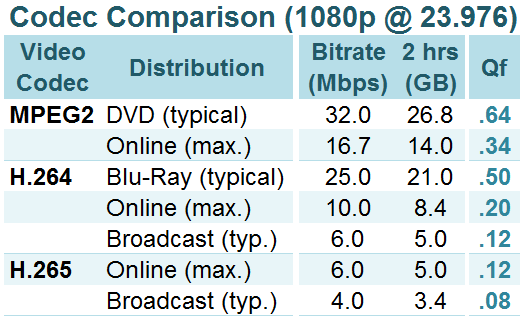 The accompanying table shows a comparison of Qf using nominal figures for DVD, Blu-Ray and the recently ratified H.265 codec (aka. High Efficiency Video Coding, HEVC). As the compression standard used for encoding the video improves, this corresponds to a reduced Qf. 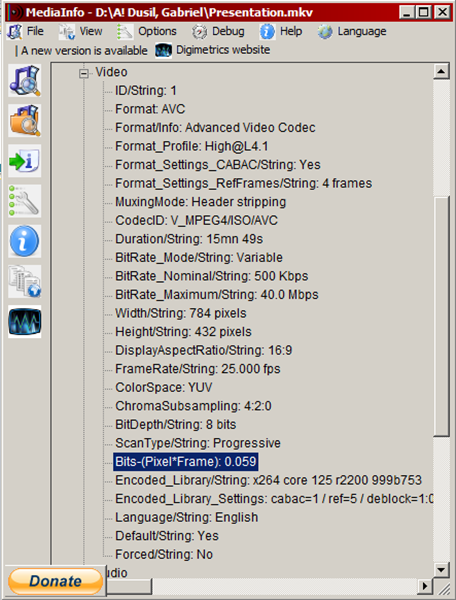 Although Qf may be considered an inaccurate measure of video compression quality, where it becomes valuable is during the video encoding or transcoding stage – especially when multiple videos are required for processing, and an administrator has the option to choose consistency in the profile used and all related sub-parameters. Choosing a single Qf in this case will ensure global uniformity of compression density across the entire library. There are several internet forum discussions on the optimum quality that should be used for encoding (or an ideal Qf). Realistically, every video has its own unique and optimum settings. Finding this balance for each individual video would be impractical. For this reason, grouping video libraries by genre, or content type, then using a Qf for each group is a more reasonable compromise. For instance, corporate presentations, news casts, medical procedures – basically any type of recording with a lot of static images – could be compressed with the same Qf. The corresponding file for these videos could be as small as 1/20th the size of a typical Blu-Ray movie, with no perceivable loss in video quality. As shown in the table, the Qf metric is useful in showing that a 1080p movie using the MPEG2 codec (aka. H.262 under the ITU definition) at 16.7GB (Gigabytes) of storage (with a Qf = 0.33), compares equally to 10GB using H.264 (Qf = 0.20). Or in the case of H.265 a file size of 6GB (Qf = .6) again maintains the same quality. This is because each of these codecs significantly improves the efficiency on the previous one, while maintaining the same level of perceived video quality. Ascertaining a video’s compression density can be achieved using MediaInfo, an open-source software package. This utility is an excellent resource in determining the formatting and structure of a given video file. MediaInfo displays a plethora of metadata and related details of the media content in a well laid-out overview. This includes granular structure of the audio, video, and subtitles of a movie. The layout of the data can even be customized using HTML and entire directories can be exported as part of a media library workflow. It’s an indispensable resource for content owners and subscribers that are managing large multimedia databases. The H.264 codec (MPEG 4 AVC, or Microsoft’s own VC1) improved on the efficiency of MPEG2 codec, developed in 1995, by around 40% to 50%. Although H.264 was created in 1998 it didn’t reach mainstream until Blu-Ray was officially launched in 2006. The H.265 standard, currently promises a similar 35% to 50% improvement in efficiency. So when MPEG2 needs 10Mbps to transmit a video, an H.264 codec could send the same file, in the same quality at 6Mbps. H.265 can achieve the same at 3.6Mbps. The trade-off in using H.265 is two to ten times higher computational power over H.264 for encoding. So expect video encoding to take up to ten times longer to encode when using today’s processor. Thankfully devices will need only a two to three times increase in CPU strength to decode the video. The new H.265 standard ushers in multiple levels of cost savings. At a storage level, costs saving of 40% would be significant for video libraries hosted in any cloud. Content hosting facilities or CDNs (content delivery networks) are costly endeavor at the moment, for many clients. It may be argued that storage costs are a commodity, but when media libraries are measured in Petabytes then these capital cost savings help the bottom line by using newer and more efficient codecs. Also, bandwidth costs will play an important role in further savings. Many online video platforms charge subscribers for the number of gigabytes leaving their facilities. Halving those costs by using H.265 would have a significant impact on monthly operational costs. On the flip side, video processing costs will increase in the short term, due to stronger and more expensive CPU power needed at both the encoding and decoding stages. Existing hardware will likely be used to encode H.265 in the short term, at the expense of time. But dedicated hardware will be needed for any extensive transcoding exercises, or real-time transcoding services. Subscription-based internet services significantly compress their video content compared to their Blu-Ray counterparts. It’s a practical trade-off between video quality and bandwidth savings. But the quality of video only becomes a factor on certain consumer devices which can show the deficiencies of a highly compressed video. For example, a 60” (inches diagonal) plasma screen has the resolution to reveal a codec’s compression artifacts, but for a TV less than 40”, these artifacts would be hardly noticeable to the average consumer. For the most part, a 1080p title is barely distinguishable in quality to 720p on even a medium-sized television. Likewise, for many views watching on a majority of mobile device, high resolution content is both overkill and costly. At the moment video playback on mobile devices still poses a challenge for high definition. Thanks to multi-core processing on smartphones consumers are on the brink of having enough power to play full HD video, and can even run other processor intensive tasks in the background. Although quad-core processors such as the Cortex A15 from ARM and nVidia’s Tegra 4 (also based on the ARM architecture) have the ability to play some 1080p video, they will still struggle to play a wide library of full HD content without requiring some level of transcoding to lower profiles. 2013 is ushering in a wide range of handsets claiming 1080p support from HTC, Huawei, Sony, Samsung, and ZTE. Multicore GPU and CPU running at ultra-low power requirements are asserting mobile devices as a viable platform for 1080p. In the meantime, the resilience of H.264 and H.265 is in their use of encoding profiles (eg. baseline, main, or high and all associated sub-levels). The use of different profiles ensures that the best quality video experience is delivered within the limitations of the device playing the video. Low profile’s such as baseline require minimal processing power but do not efficiently compress the video. High profile modes are highly efficient and squeeze video file size as small as possible. Thus bandwidth is used efficiently, but requires higher processing power of the end-device to decode the video. Although the latest Apple iOS devices support high profile, most smartphones still use lower profiles to ensure wider device compatibility. In the interim, internet video providers continue to encode titles into multiple profiles to suit a wide range of subscriber devices, accommodate their limitations in decoding capabilities, and maximize each individual viewing experience. Higher profiles in H.265 will also have an effect on consumer electronics (CE) equipment. Current iterations of these appliances are not equipped to handle the required processing demands of H.265. The next generation Home Theater PC (HTPC), Set Top Box (STB), or Media Player, will require upgrades their processing engines to accommodate these next generation codecs. Lab testing is still required to showcase that next generation computer processors will have the ability to decode H.265 at higher bit depth (eg. 10 bit), and resolutions as high as 4K resolutions. Some estimates state that 4K using H.265 will require 80 time more horsepower compared to HD using H.264. To further compensate for the vast differences in mobile coverage, and best-effort internet communications, Over the Top (OTT) providers, and Online Video Providers (OVP) are offering advanced video optimization features such as Adaptive Bitrate Streaming (ABS). This is a solution to optimize video quality sent in real-time. Protocols such as Apple’s HLS, and more recently MPEG-DASH have been developed to provide a universal approach to implementing adaptive bitrates. The need for Adaptive Bitrate Streaming and related techniques is just a stop-gap requirement. As quality of service improves and bandwidth speeds increase, the need for optimization techniques will diminish. In some regions these techniques may completely disappear. Certainly, during the days of the analog modem, bandwidth was at a premium, so compression techniques and sophisticated error correction methods were used to maximize data throughput while also saving costs for the last-mile. As bandwidth increased, these line adaption features were no longer deemed necessary. Similarly, the need for bandwidth optimization techniques will be diluted in regions where mobile 4G LTE (Long-Term Evolution) will become ubiquitous. Speeds will become so reliable that even the internet’s best-effort will be sufficient to deliver multiple 4K videos, in real time, to any device. ©2013, All information in this document is the sole ownership of the author. This document and any of its parts should not be copied, stored in the document system or transferred in any way including, but not limited to electronic, mechanical, photographs, or any other record, or otherwise published or provided to the third party without previous express written consent of the author. Certain terms used in this document could be registered trademarks or business trademarks, which are in sole ownership of its owners. Originally used in Gordian Knot, http://sourceforge.net/projects/gordianknot/, an open source project for encoding videos into DivX and XviD formats. This software is no long being developed. With multi-pass encoding, the encoder becomes aware that some static parts of the video can be encoded with lower bitrates compared to complex scenes requiring higher bitrates. This knowledge encodes the video more efficiently, but requires higher processing resources and time to complete the task. This table shows the typical frame size for MPEG2, H.264 and H.265. For consistency and for the sake of comparison, a frame aspect ratio of 16:9 is shown. The Cinemascope frame size of 2.39:1 or 2.35:1 would further alter the figures. The table also does not take into account the audio channel, which roughly amounts to a 10% increase in bitrate and file size (when a similar quality codex are used in each instance). Also not under consideration is a pixel bit depth higher than 8, such as in professional video recording, and common frame rates of 25, 29.97, 30 or 50fps are not considered. In the context of this article, ½HD is referred to as 1280×720 resolution. Pingback: فشرده سازی حداکثری فایل های تصویری — چی جوری؟!